Project Victory_Overland 08 LR3 Build Thread! A few weeks ago, I wrecked my LR3 avoiding some tourists on bikes, only to rearend the car in front of me. Needless to say, the Toyota Corolla didn't fair so well and nor did "Victory", my 08 LR3. Bottom line, due to shipping cost and price mark-up on Landy parts in Hawaii, the repair cost exceeded the total value so the insurance wrote it off. HOWEVER...I did come off pretty good in this deal. Low miles and the great shape of the vehicle set my total value at just under $15.5K back to me. The high repair cost and low low demand for Landys on Hawaii gave me a buy back option of $1800.......SOLD SOLD SOLD. I am the owner of my Landy again for $1800 and have all of my parts coming in from Atlantic British, Lucky8 and RoverSpecialties....oh, and don't forget Amazon. Victory runs, but she's in Limp mode and will not stay running due to the fan not rotating and no coolant. I pulled everything off the front, the quarter panels and hood are in excellent shape. Lights, front grille are in excellent shape. The front bumper, support, radiator support, AC condenser, coolant lines and radiator are junk. Fan rotates just fine now but is being replaced as well as the fan adapter, clutch and fan. I have all new parts in the this area and plan to replace the water pump, all pulleys, fan/clutch, radiator, support, condenser, all hoses, switches, etc... while I am in there because its at 79k miles and I have it all exposed and easily accessible. THERE IS NO FRAME DAMAGE, ALL IS REPAIRABLE BOLT ON PARTS AND I'M JUST AT $1800 WITH PARTS AND SHIPPING FOR EVERYTHING NEW MINUS THE OFF-ROAD BUMPER (HAVEN'T PICKED IT YET). I need a good code reader, scanner, tool, etc... to clear all my codes and reset my suspension, etc... and ensure when I am going back together, everything is peachy in the brains department. I only want to buy it once, what do you suggest? BUMPER: IN ORDER I LIKE BUT NEED FUNCTION OPINIONS FROM USERS. Other options would be appreciated if they are out there. An off-road bumper fixes much of my cost issues in repairs by thousands of dollars in factory plastic and paint. I've narrowed down my choices, not in any order and I like a bit of each but not sold on any just yet. 1) Proper Spec / Lucky8 bumper: on their LR3. Love the look, the recovery points and the partial bull-bar. I can get it on Ebay and or Lucky8 but appears to be some communications problems with them on actually making a purchase and answers back in a timely fashion. 2) ARB: Tried and true name. I've heard of fitment problems but I think that's rare. No recovery points but gives me airbag reliability and I think I like that. 3) Tactical Rovers: Looks awesome, has recovery points, don't dig the bull-bar being so high on the front. I plan to run Johnson Rods or equivalent when I hit the trail and allow me a second set of wheels (Factory 10 spoke/maybe Compomotive) with MUD Tires only with bit bigger option. What I really want is to move the wheels out to the fender wells and keep my factory 10 spokes for daily use. What are my options on what works and what is safe?..........safe being the first order of business. Glad to hear you got to keep it! Buy an IID tool. Hands down. Will run/clear codes, flash firmware, perform resets, allow for testing of components. Plus it can lift the vehicle and save 3 height preferences. IMO don't run rods or spacers/whatever. Maybe if you plan on running bigger tires but IMO the 40mm lift I have is just enough for me. Bluetooth version is a few bucks more but can push insane amounts of live data to your phone/tablet. It is awesome. I don't know anyone that regrets buying one. Do you not have the stock 18" wheels? If you have the 19's I could see why you want compmotives or other but otherwise keep the stock wheels. I would go with an ARB up front. TR rear (would do kaymar if I could find one here). 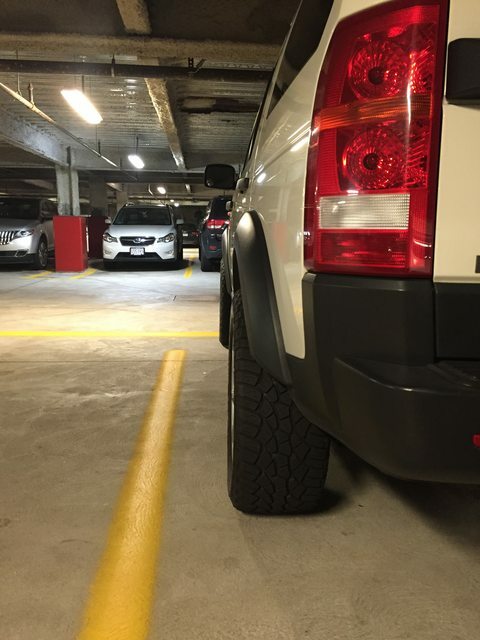 Only fitment problems I have heard of with the ARB's was from the Discovery 4, not the 3. Plus the front recovery eye from your frame should be enough of a recovery point... I have seen shackles fitted to an ARB but I cannot imagine that is stronger than the OEM loop. Fair warning: I haven't fitted one yet, but plan to. Thanks so much for all of that info in the response. This is exactly the kind of feedback I was hoping to get. In response, YES, I have the factory 18" and plan to run another set of 18" with a bigger MUD Tire for those long weekend trips in the mountains where I need more traction in the Hawaii mud. Right now I run the NITTO AT 255/60R18 for all around but need more traction in the upper hills where it rains everyday. For me, it is worth a second set of wheels for the mud tire and I considered Comps, but maybe will just keep looking for factory 18. Like I mentioned in the post, Landy spares are hard to find here on Hawaii so I might have to buy them mainland in hopes someone will ship them to me. Thanks for the heads up on the ARB. I really appreciate that solid feedback on the recovery point and maybe that is why ARB didn't install them as they were not needed. Plus I think with a winch/bumper combination there could be a weight factor when you are snatching from the bumper and not the factory recovery point. I am surely getting the TR rear (Same, I wish a kaymar was affordable and available) and I hoped to have it by now but since I am in repair mode, the money had to go to the front now instead of the rear. I plan to run a full size mud tire as most likely my puncture would be in the mountains. I can always limp it home on an odd sized tire anywhere else. I am not running it, just know the truck went into Limp mode once the coolant drained out. I am moving it around on dollies now until I am ready to fire it back up. I guess I'll order the IID Tool tonight so it gets here soon and ready for when I have the front of the engine together and the coolant system ready for starting and leak check. Gotcha. I misunderstood about the wheels statements. That is a great idea running two sets so go for whatever you can find, whether its a set of 18's of fleabay or whatever, the $$$ compmotives . Got it, I figured you probably weren't but always needs to be said. Best of luck with the front end work! You are very welcome! Happy to help. I would put the LR4 facelift on it. It's gonna be about the same price for the front clip either way, might as well make it look a couple years newer. Can't say enough about the iiD tool - get it and never leave home without it. On bumpers I'm running an ARB and wish I had gone with the Tactical. My ARB wasn't a 'bolt on' - it required use of a sawzall, grinder, and welder. When questioned about the fitment issues ARB-USA's response came down to 'sorry, we don't really know anything about Rovers'. Nice. I was initially put off by the look of the Tactical in photos but last year I got a chance to see one in person and liked it. The main things I like about it over the ARB are the recovery points and the fact that winch access is better. The ARB is horrible for winch access. I also don't like how the ARB sticks out sooooo far. Not good for approach angles at all. Also of note, Tactical is a small shop and I bet they'd work with you on the bull bar if you didn't want it. 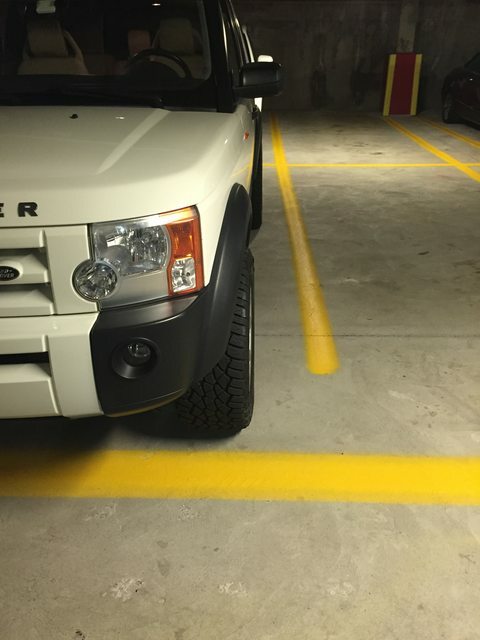 Also look at their rock sliders - I think they're the single most important piece of armor for an LR3. (I run them as well as their gas tank and Tcase skids) And they're in SoCal, so shipping would at least be better than the east coast. I like Eric at L8 and have bought a lot of stuff from him but they are often hard to reach by phone (maybe I've just had bad luck with the winter weather back there?) and their website is a disaster so you pretty much HAVE to talk to them in person to actually buy anything. http://www.motorsport-tech.com/special/truck/landrover_s?Next=16-30 The key is to be sure the spacer is hub-centric just like the OEM wheels. I have a set of 3/4" spacers I ran before I went to my current 33" tires and may run again. On the LR4 facelift, if the parts cost is the same might as well. But if it's more money I wouldn't bother as the front bumper will hide most of it anyway. hahaha, yeah never a good time to wreck the truck. I have all of my parts in now though so I'm ready to start working on her. She'll be back in the fight soon I hope. Still haven't bought the IID tool but since everyone has one, I have to keep up with the Jones' so I'm gonna purchase one this week. My hood, lights, and fenders are all good so no need for me to swap over to LR4 parts. I thought I had to do fenders and lights and grill for that anyway. My stuff is all good except the bumper and support so I'm just doing the bull bar bumper after the radiator repairs. the Gap tool is VIN specific I believe. Anyway Good luck with the rebuild. Zelatore is a friend of mine and is a subject matter expert on the LR3/4. In fact I didn't know that he felt that way about the ARB bumper. No I'm second guessing it. Thanks for the parts and taking care of me Atlantic British and Amazon Prime. Let the project begin. Thanks for the info on the spacers. I'm not sure if I want to 1" or 1.25" spacer so I will have to measure them when its pumped back up at ride height and off-road height. I don't think I will run too much bigger of a tire since I would have to go fairly big to get any real benefit of extra side wall. However, pushing the tires out a bit for a wider stance and going up a tad bit in sidewall gives a few more mud tire options which is what I want. In my opinion, 0.75" Spacers are the way to go. They will give you plenty of clearance to run whatever width tire you want without requiring a lot of modifications to your fender liners, fender flares, frame horns, and front bumper. 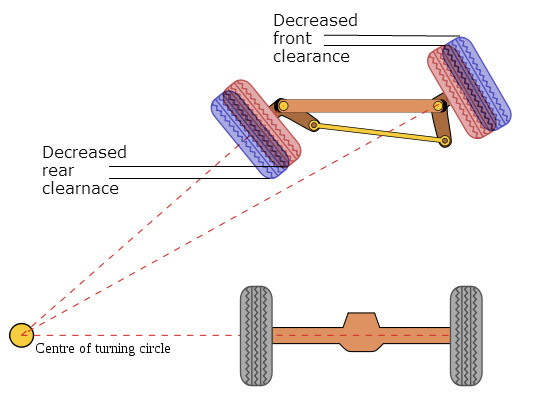 Adding spacers increases the amount of travel forward and back of the wheel, and you can run into problems fast. -You can run a 285/65/18 AT (not MT) tire ( 11.2" wide, 32.6" tall) without any spacers and you will only have to trim some of the inner fender liner and relocate your sensor wires on the left front. If you have rear AC there may be some lines to relocate in the left rear running this size but I don't so I cant comment on experience. 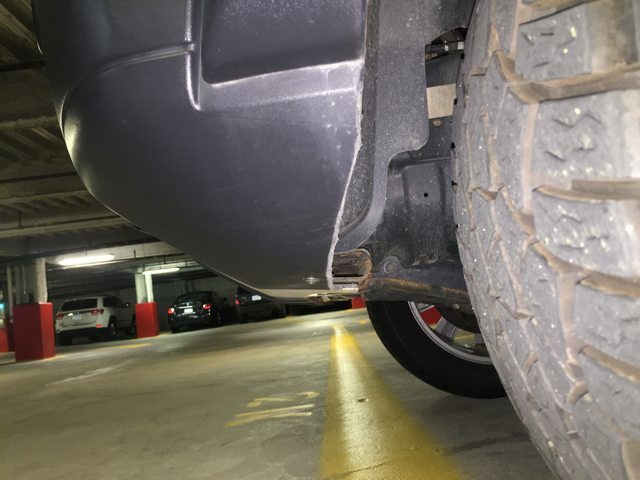 -You can run a 285/50/20 AT tire (11.2" wide, 31.2" tall) with .75" spacers BUT you will need to remove about an inch from the bottom of the front bumper and pull the fender liner forward or run an aftermarket front bumper. My point is, that despite moving down in diameter from a 32.6" tire to a 31.2" tire, I actually had to modify my front wheel clearances MORE. Thanks for the pic. Is that pic at normal ride height? I do like the look. Not that an extra 1.5 overall is going to give too much, but will provide a bit more clearance on the inner wells. Where did you get the spacers from? That is at "normal" height but I am running about 1.5" lift in front and 1" lift in back thanks to the IID tool. Here's a closeup of the front bumper trimming I had to do to make room when i put the .75 spacers on. The screw in the bottom that holds the fender liner is actually relocated about an inch forward of its normal location.